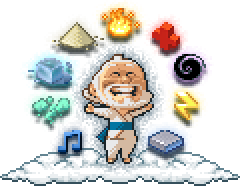 Craft your world in pixel blocks with The Sandbox, a unique powder / falling sand game on your iPhone, iPad, Mac, Android and Blackberry devices! Build or Destroy, Create pixel art, play with laws of physics, make electricity or chiptune music! The Sandbox, which literally takes place in a sandbox, is a unique game based entirely on the laws of physics and giving access to over 230 different elements. The player takes the role of "Deity apprentice" and sets about crafting his or her own universe through the exploration of resources such as water, soil, lightning, lava, sand, glass, and many more complex elements: humans, zombies, robots, dinosaurs, monuments, wildlife, animals, trees, gems, vehicles, sensors, explosives, contraptions, etc.. Craft these resources together and play with some pixel blocks to generate YOUR unique virtual world ; embrace your inner pixel artist or compose some wonderful chiptune melodies! Players will delight at the variety of missions they'll encounter, from simple tasks like using water and sand to make mud, to more complex challenges like making a battery or building an electrical circuit. You'll have the power to create and destroy. No aspect of nature shall be beyond your grasp, you're limited only by your imagination. Play as a benevolent deity and give life to majestic mountains and beautiful forests, or embrace your vengeful side by spawning raging fires and devastating explosions. Nature is yours to command, as are various other man-made objects like light bulbs, heaters, oil lamps and diodes. And once you've created your glorious universe, you'll be able to save it and share it in the online gallery. -Unlimited gameplay, you're limited only by your imagination! -… and even a brand new intelligent life-form : Humans ! Use the magic powders to change their behaviours : Miner, Builder, Hunter or Woodcutter (many more to come). You'll also be able to turn them into Zombies after completing the spick-and-span Zombie Attack Campaign! -Wreak havoc with powerful explosions with TNT or C4! Craft your own guns or massive destruction weapons and unleash the power of the Lasers by combining them to different gems! -21 exciting campaigns -- a whopping 310 game levels in all! -Share your creations in the Online Gallery, browse what other players have created and rate the best worlds! "The Sandbox is a fantastically inventive mobile game that encourages players to create entire worlds and works of art!" "The Sandbox is one of the most unique iOS titles of 2012 in terms of looks (sweet pixel art) and gameplay (novel blend of puzzle and community)"
"The Sandbox is a charming little pixellated 2D world-creation game -- and, by world, I mean the space inside of a literal sandbox." "Pixowl is working on the next big thing since... well, I'll just come out and say it... since Minecraft. There, I said it." "The Sandbox really wants to live up to it's name"
"First up, and the most impressive on show, was The Sandbox think Minecraft in 2D, thats heavy on simulation." "The Sandbox is definitively the Falling Sand game on iPhone I've been craving for ages!" "I've been playing powder games for a long time now and The Sandbox brings it to a whole new level on iPhone, thanks guys!!!"